Sure, wood-fired pizza ovens are all the rage right now. But chefs — can you imagine running a restaurant without the modern conveniences of electricity or natural gas? What would you do? How would that affect your culinary output? Can you imagine tending the fire, stoking the coal, continually sweeping up the ashes? 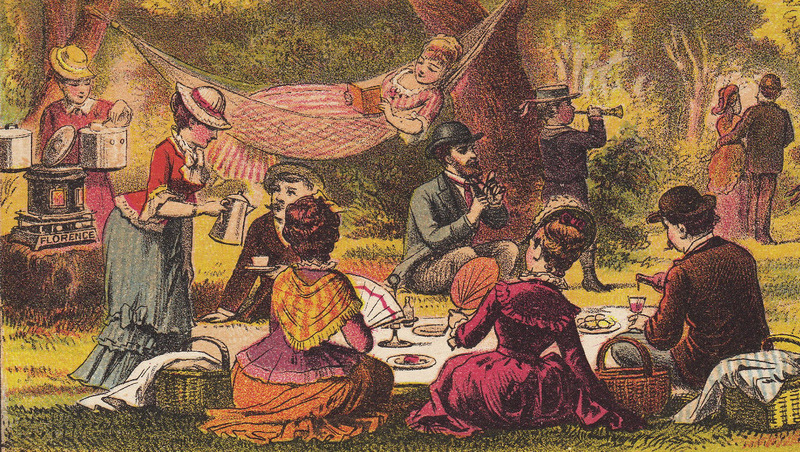 That was the reality for San Diego restaurateurs in the 1880s — or any cook for that matter. Wood, coal oil and coal-fired ovens were the norm. Oil lamps, natural and candle light were de rigeur. Buy your fuel from old man Johnstone’s hay and coal store. Or from larger companies like Caledonia, Pacific Wood & Coal, Pioneer, or San Diego Coal. But don’t be late in your payment — you’ll get a visit from their collector, FF Garretson. Coal distributors made fortunes shipping and supplying their product throughout the country. Although relatively scarce, local California coal was shipped from Contra Costa, Alameda and Monterey counties. And in the 1850s a group tried to mine coal on Point Loma, but went bust. Their open mine shaft was visible for a hundred years. It has been recorded that Point Loma, like much of California’s coastal lands, was once covered in forests of original growth oak and scrub. In 1602, Spanish explorer Sebastián Vizcaíno described the woods on his mapping and surveying mission. It is he who named the lands ‘San Diego’ previously discovered by João Rodrigues Cabrilho. It wasn’t until 1881 that an entrepreneurial investment group founded the San Diego Gas Company, which provided petroleum-based gas to 89 subscribers in New Town San Diego. It was a messy affair — oil and tar routinely came through the mains. After a few years, they switched to produce gas from a nice, clean, modern coal-fired plant. The Gaslamp Quarter was borne. The first public streetlights were carbon arc lamps high atop towers. A lampman would travel from tower-to-tower on a bicycle to replace the carbon. The first intercontinental railroad arrived in November of 1885, sparking interest in San Diego, and starting a mad land boom. It was a great time for new businesses in San Diego. Real estate sales were strong. Construction was up. Within three years, San Diego’s population surged from a quiet 4,000 to over 30,000! 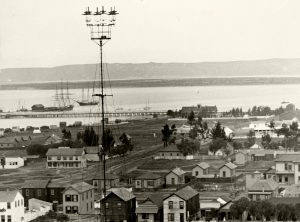 In 1886 the Jenny Electrical Company erected San Diego’s first electric street lamps — 100-foot-tall towers equipped with carbon arc lamps that lighted blocks at a time. The company was bought the next year by Elisha Spurr Babcock, who used the technology to light his new transbay project, the Hotel del Coronado. Businessmen Frank E Thomas and CE Thomas founded Eureka Combination Burner & Liquid Fuel Company of California with some associates. 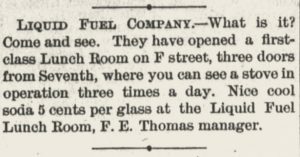 They took out patents for a new ‘non-exploding’ oil-fueled stove, and sought its promotion through the opening of their Liquid Fuel Lunch Room on the ground floor of the Hollister building at 1612-20 F Street. 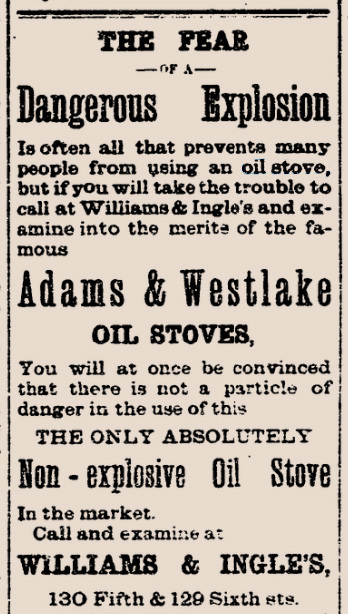 The inflammatory buzz-word ‘non-exploding’ was a big deal, and used in advertising by many manufacturers of liquid fuel stoves at the time. Now, instead of constantly tending a smoky coal or wood fire you could have a continuously-fed, constant-temperature oven. It was great for baking. Businesses turned over quite rapidly after San Diego’s short-lived land boom went bust in 1889. Thomas started serving dinners and changed the restaurant’s name to the Liquid Fuel Dining Room. There was even talk of opening up additional locations. Mrs Ellis ran the Hollister boarding house upstairs and sent her guests down for meals — Liquid Fuel served chicken or roast turkey and cranberry family meals on Sundays. The Hollister building is long gone and today at the location stands the downtown Salvation Army building. “old man Johnstone” and other contemporary businesses cited are from San Diego city directories, 1885-1894. “local California coal was shipped” Arthur M Hull and Sydney A Hale, editors, Coal Men of America: A Biographical and Historical Review of the World’s Greatest Industry, Chicago, Illinois: The Retail Coalman, 1918. “Point Loma” and “Richard Henry Dana Jr” is from Herbert Lockwood, San Diego’s hysterical history: Fallout from the skeleton’s closet, Coda Publications, 2003. “San Diego Gas Company,” “San Diego’s population,” and “Jenny Electrical Company” are from from Bill Dyke, ‘Seventy-five years of light,’ Journal of San Diego History, [vol 2, no 3] July 1956. “nice, clean, modern” just kidding. 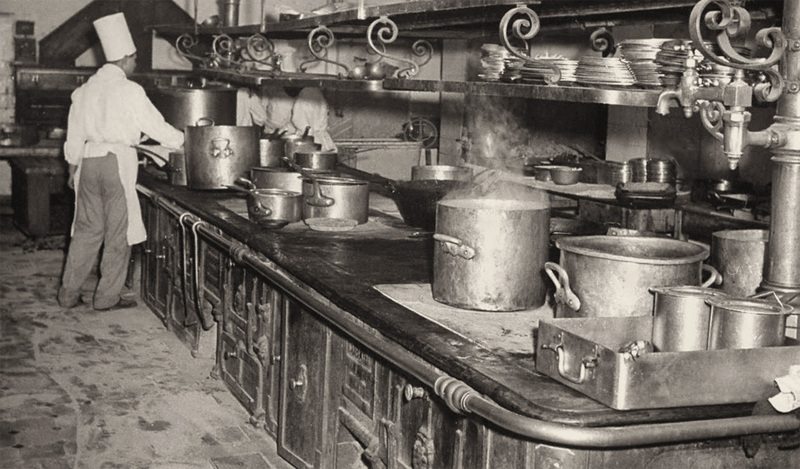 Phyllis Minerva Ellin, At home with the range: The American cooking stove, 1865-1920. (Masters Thesis). Philadelphia, PA: University of Pennsylvania, 1985. “short-lived land boom” The railroad’s arrival in San Diego, improvements in electric and gas utilities sparked a land boom in the area from 1886 to 1889. And with the boom came people. In 1885, San Diego’s population was about 4,000. In three years, it increased to 30,000. And by 1899 – a mass exodus decreased the population to 16,159. Yikes! No wonder so many businesses and restaurants went under.